Enjoy one of the few ground level villas with an ocean view while staying at Kolea 6A. Kolea 6A offers a nice view of A'Bay out over a vacant lot. Not being a rental prior to 2017, this villa still offers a new feel. The great room has been nicely decorated with an Asian decor and features a couch with two chairs and an entertainment center that features extended cable with a big screen wall mounted LCD television. Adjacent is the dining area that seats 6. The gourmet kitchen features granite counters, stainless steel appliances, and is well stocked. The lanai pocket doors open up off of the great room to allow for a seamless transition to the exterior. 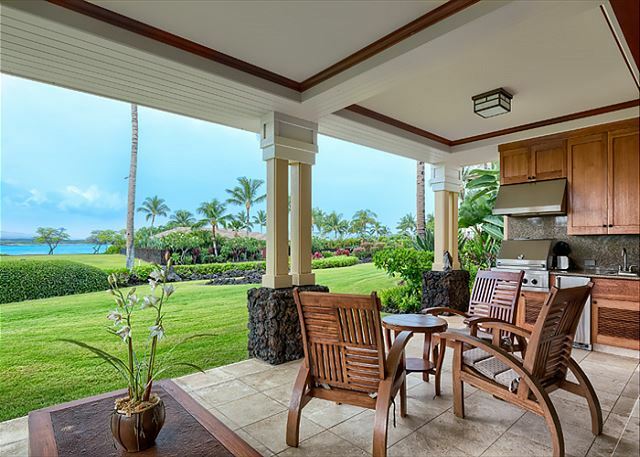 The lanai has a couch with a small table and three chairs. There is a wet bar for your use that also features a stainless steel grill. There is a small lawn area out front and the view overlooks a vacant lot with the ocean as the backdrop. The master bedroom has a king size bed with bedside tables facing a chest of drawers with a big screen LCD television on top with extended cable. The attached bath has a large walk in shower, deep soaking tub, double vanities, and a walk in closet. In the middle of the villa is a guest bedroom with a queen size bed with bedside tables facing a wall mounted LCD television. There are two closets for your use. The attached bathroom has a tub/shower combo with a vanity. Just off the kitchen is the second guest bedroom with two twin beds and a night stand facing a wall mounted LCD television. The attached bathroom has a walk in shower and a vanity. 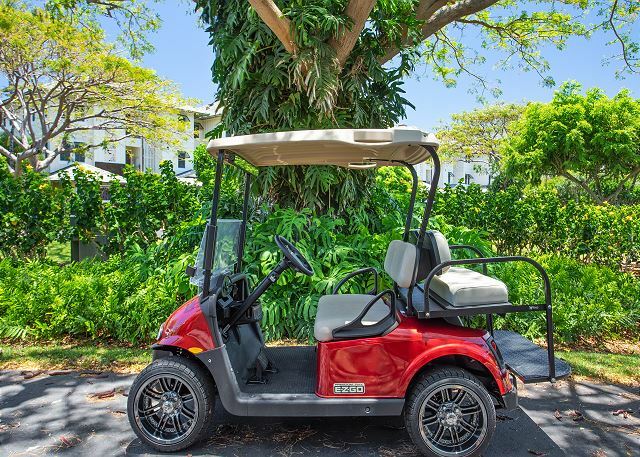 Other Kolea 6A amenities include a laundry room with a washer and dryer, wifi, dual zone air conditioning and use of the golf cart. 5/5 stars Review by James R S.
The nicest vacation rentals we have enjoyed. We travel to the Big Island once or twice at year. Probably our 10th our 11th trip.Three issues that could use improvement:Hand shower head in main bath broken, comes apart when used in massage mode.Not enough paper products, TP, tissue and paper towels in the unit.Retractable vent for the cool top was very dirty. Management team was kind and professional, condo was lovely and perfectly appointed, neighborhood is fantastic with lovely pool and easy access to the beach, shopping, restaurants.